We have been really enjoying our walks around the neighborhood lately. With all of the beautiful colored leaves and the perfect weather we have been having, it is such a wonderful time of year! 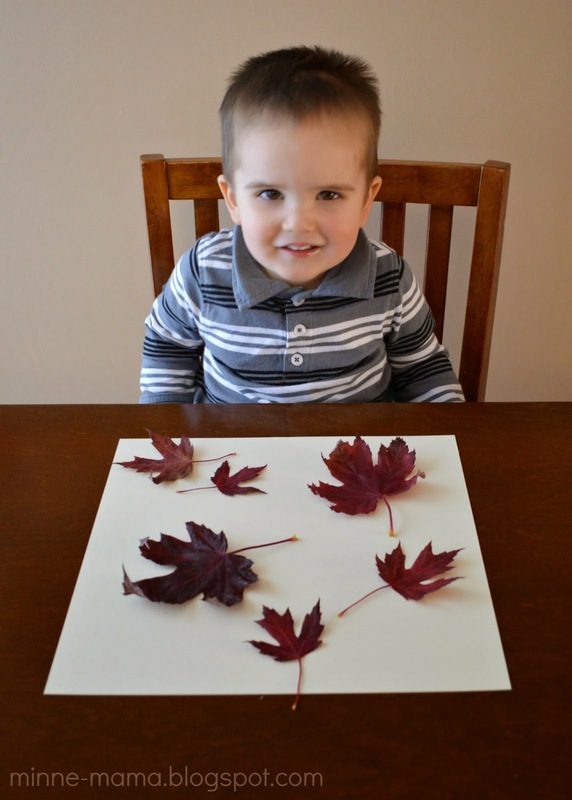 Skyler will often talk about the colors he sees and the sounds he hears (stepping on crunchy leaves and listening to the leaves blow around are such great noises! ), but then he will also say things like "The leaves change colors and fall off before the snow comes! And then the snow plow will come!!" in the most excited voice. It is adorable, but I am just happy to enjoy this beautiful fall weather before that season that shall not be named arrives! 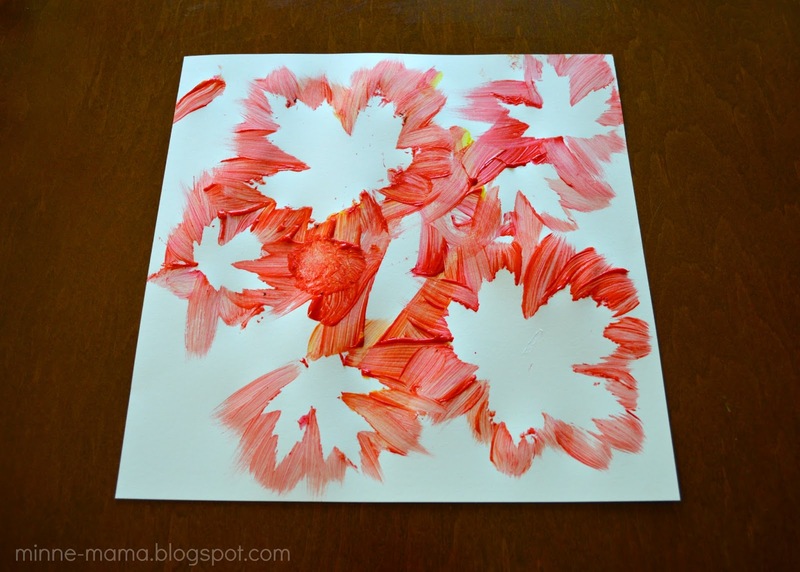 During a recent walk we saw the most amazing red colored leaves, so we grabbed a bunch to take home and had a lot of fun with this simple painting activity. 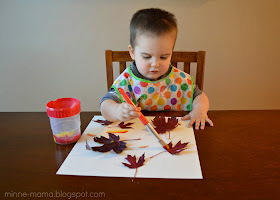 To start, I put a loop of tape on the bottom of the leaves and Skyler stuck them onto his paper. I loved how it looked like they were blowing around and he was so proud of setting this up on his own! 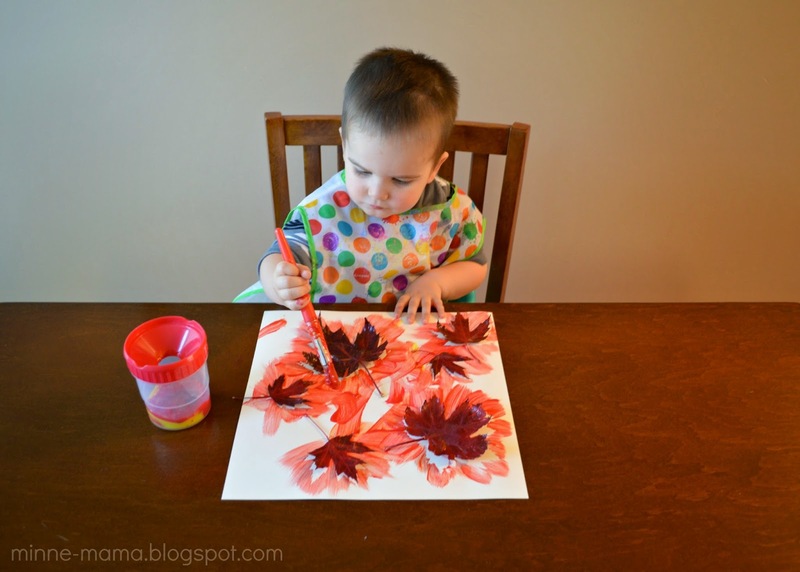 Next I squirted some yellow and red paint into a cup without mixing them, and let Skyler mix the paint as he went so we would have different shades of yellow, red, and orange with our leaves. I thought that Skyler would mostly paint on the leaves or on the white portions of paper, but I was happily surprised when he did big strokes from the insides of the leaves and out. 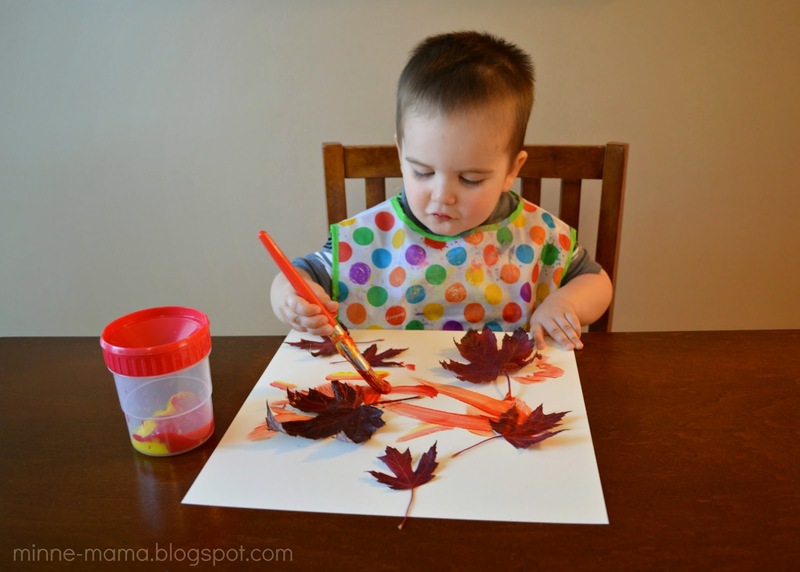 He carefully filled up his paper and the resulting picture is so festive and fun! 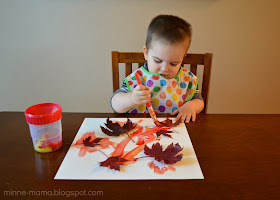 When Skyler told me he was finished with his painting, we went through and carefully peeled off the leaves and tape and were left with some amazing resist leaves! The final product is even more beautiful that I thought it would be and I just love it! Such a festive painting that we will use to decorate for the season for many years to come! 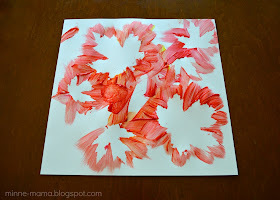 This simple painting activity is a lot of fun, between the leaf collecting, deciding where to place the leaves, and watching the colors mix on the paper to resemble the leaves we see changing outside, we enjoyed this craft from start to finish! I have been asked about Skyler's paint cup and smock, both of which we love and use ALL the time. 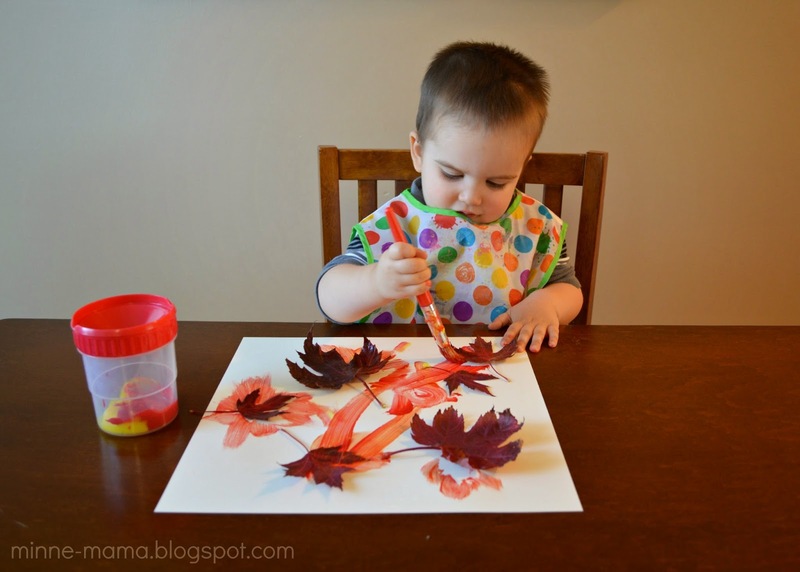 His spill proof paint cup is from Melissa and Doug, and I got his Crayola art smock at Target in the craft aisle. I do not see it on their site anymore, but it is on Amazon! That's a really neat cup you used for his paint! Where did you get that? And what type of paint did you let him use? Skyler is using finger paint for this. Even though he didn't end up using his hands to paint at all (which he usually does) it is so easy to get off the table! I added the link to our paint cups in the post! Thank you for the comment! I bought cups like that at Ikea. they are cheap too. 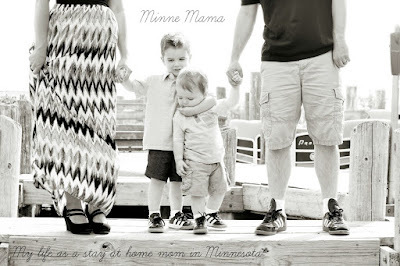 I had to share this link on my blog because it's such a cute idea! Thanks for inspiration! This was a piece of 12 x 12 in scrap booking paper which worked great because it is pretty sturdy. 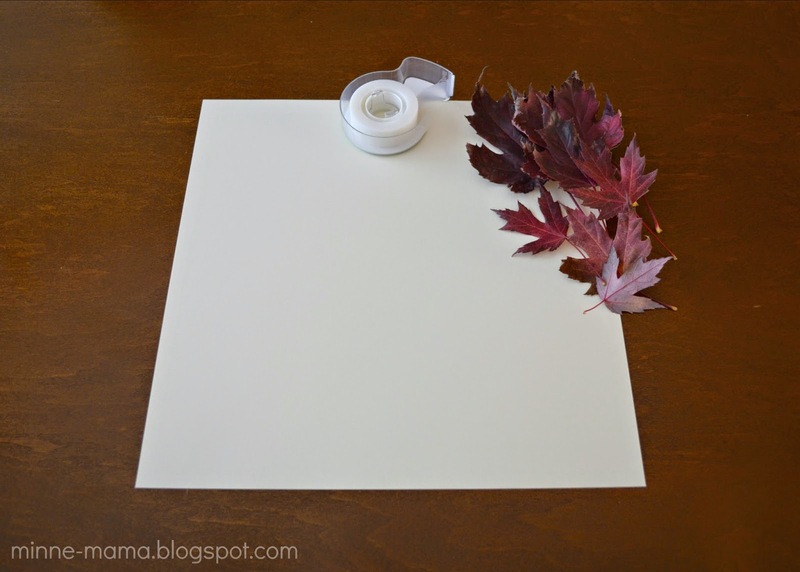 If you wanted a certain size to fit a frame, you could use a school poster board and cut it to the size you need! I always just take out the glass from the frame and use that to measure the exact size :) Hope that helps! Just came across this. I love it, what a great idea! I'm going to use it for my teenage Girl Scout troop. They still like to do crafts and this is really unique. Thanks! Young Explorers have the paint cups and smocks! I love it ! So simple, what a great idea for my boys. Thank you for the sharing. That was such a great idea!!! I am so going to use this for my kids in my class. Thank you for sharing the idea. I'm an assistant teacher for 2.5 and 3.5 year olds and they loved this!!! The very next time I read a blog, I hope that it does not disappoint me as much as this particular one.Happy New Year Wishes I mean, I know it was my choice to read, but I truly thought you would probably have something useful to say. All I hear is a bunch of crying about something that you could possibly fix if you were not too busy searching for attention.